In a recent article I explained the term of a management agreement, and in this article I’ll discuss management commissions; arguably the other most important clause of a management agreement. The commission is the amount of money the artist will pay the manager under the contract. This is usually done as a percentage of the artist’s gross income. Standard percentages are usually 15-20%, with 15% being more common than 20%. I have seen the percentages range from 10-25%, but with both extremes requiring special circumstances. Some more creative deals featuring other percentages have also crossed my desk, but again, these deals require other career aspects or services not typically included in management deals. Aside from the percentage, it is important to know if the commission is being taken on gross or net income, and what gross or net income actually includes. Management agreements in the music industry typically have a list of exclusions on gross income that are specific to aspects of an artist’s career in the music business. This is different than management agreements in other areas of entertainment and in my experience, not all attorneys (even music attorneys) know what to exclude. It is also important to note when, if any, the manager is able to share in other income aside from the main commission. It is also common for managers to take a commission after the term of the agreement has ended – and I’ll cover that in the next article on management agreements. Erin M. Jacobson is a practicing attorney that represents musicians, songwriters, music publishers, producers, and other music professionals. She is known throughout the music business as "The Music Industry Lawyer" and her clients range from Grammy and Emmy Award winners to independent artists and companies. She works directly with her clients at every career stage and strives to protect her clients and their creative endeavors through deal negotiations and proper intellectual property management. 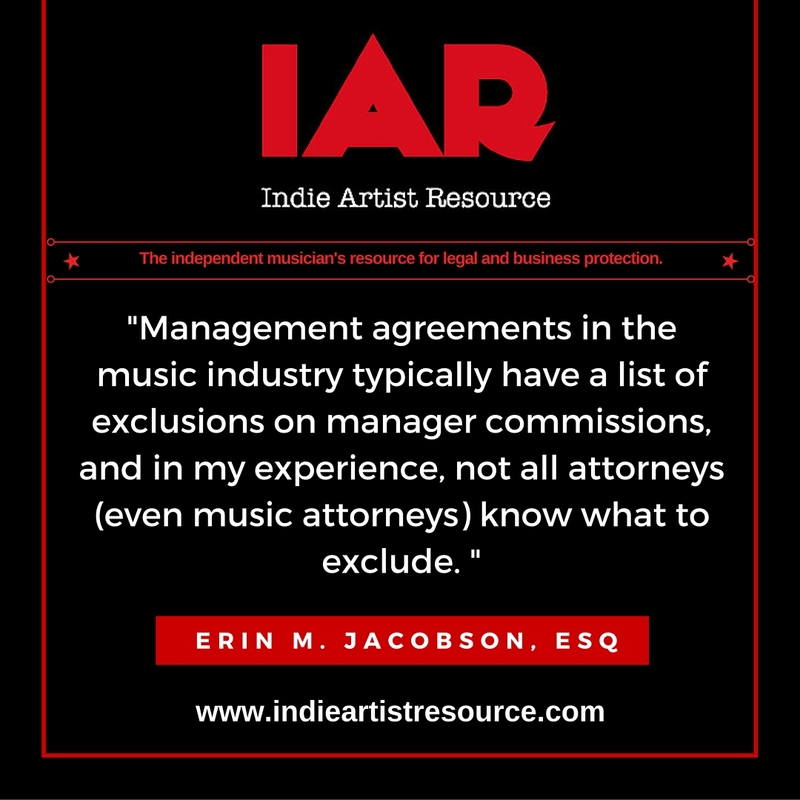 Erin founded Indie Artist Resource to provide protection to independent musicians with barriers to obtaining basic legal and business documents. agreement, contract, contract language, Erin Jacobson, erin m jacobson, how much should i pay my manager, independent musician, indie, indie artist resource, legal, los angeles, los angeles music attorney, management, manager, manager commission, manager percentage, music, music attorney, music attorney la, music attorney los angeles, music business, music contract, music law, music lawyer, music lawyer la, music lawyer los angeles. Bookmark. New Video: How Much Do Artists Earn From Spotify? Ask a Music Lawyer: Is the Poor Man’s Copyright Enough to Protect Your Songs?